In this Hearthstone Journey to Un’Goro deck tech, I take a look at Dragon Priest! Thought Dragon Priest was dead with so many dragons rotating out into the Wild with the most recent Standard rotation? 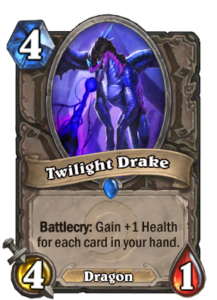 Think again, as it turns out that the power of Drakonid Operative together with the only dragon from Un’Goro, Primordial Drake, is enough to save the archetype. 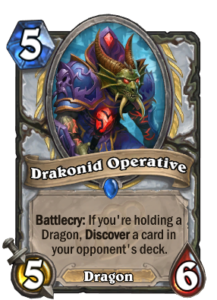 Previous to the reveal of Journey to Un’Goro, Blizzard developers were giving statements that implied that this was the end of the road for dragons, and Drakonid Operative was in Mean Streets of Gadgetzan to send Dragon Priest out with a bang. Luckily, we got one new dragon in Journey to Un’Goro, and what a Dragon it is! 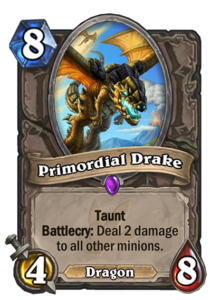 Primordial Drake is a bit on the slow side at 8 mana, but the 4/8 Taunt body together with a battlecry that immediately cleans up small minions from the board is still a powerful card. 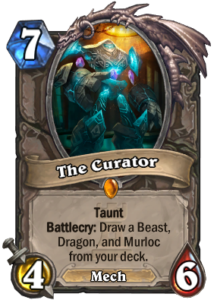 It is one of the most important cards in the expansion, as it gives Dragon Priest another good dragon card to run, and it is also awesome in Taunt Warrior both for a combo with Sleep with the Fishes and for making The Curator a viable card draw engine. It is a fairly straightforward list that is able to clear up a lot of boards, apply some pressure, and ultimately outvalue the opponent. With so many dragons out in the Wild, the core Dragon package has all but stabilized at eight cards: two copies each of Twilight Drake, Drakonid Operative, Book Wyrm, and Primordial Drake. They are the most powerful midrange dragons remaining in the Standard format, and form a stable core for the deck. Some people do experiment though. Faerie Dragon has seen some play, and you can go for one big dragon in the top end if you want, most commonly Deathwing or Ysera. It also depends on whether you run the Netherspite Historians or not. If you run Netherspite Historians, you can usually discover any end-game dragons you need, and at eight dragons, the same number that was most commonly run in the previous meta, there is no lack of activators. This shows just how important Primordial Drake is for Dragon Priest. 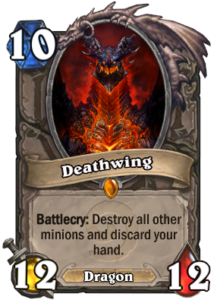 Without it, you would have to run either two end-game dragons or two Faerie Dragons, or a combination of both, and most end-game dragons do not have the immediate impact on the board that the Primordial Drake has: only Deathwing can out-do the board effect, and that comes at the cost of your entire hand. The removal options of Dragon Priest are second to none, except against 4-attack minions – the bane of Priests everywhere! 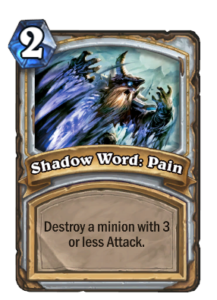 Shadow Word: Pain and Book Wyrm can remove minions with low attack, while Shadow Word: Death takes care of individual big threats. Dragonfire Potions offer unsurpassed area-of-effect damage with Holy Nova complementing the area-of-effect damage package. Finally, there is Shadow Visions. 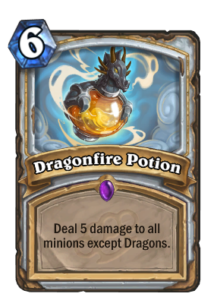 Gaining additional copies of spells in the deck enables you to have even more removal, making Dragon Priest one of the decks that can take on a Quest Rogue and beat them even after they get their quest done: Dragonfire Potion just lines up so nicely with all those 5/5s. This list wins through removal and value, especially from Netherspite Historians and Drakonid Operatives. 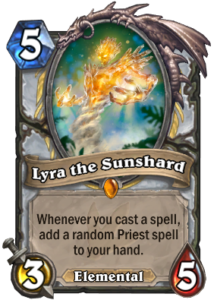 First, there is Lyra the Sunshard. 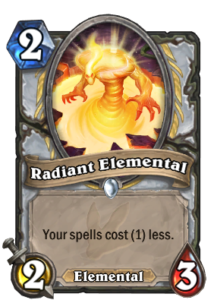 Together with Radiant Elementals, you can drop Lyra to cycle through a ton of Priest spells, often finding spells such as Mind Control, Divine Spirit, or Inner Fire in the process. Lyra and a bunch of spells can just win you games. 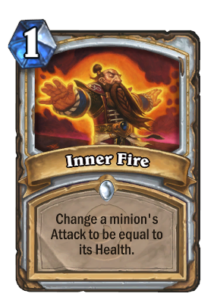 This is what the newly found Miracle Priest archetype is all about, but Lyra can also fit in a Dragon Priest list. 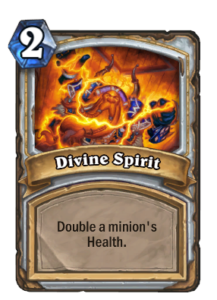 Second, you can just put Divine Spirit and Inner Fire into the deck directly. 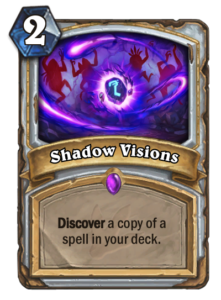 With the help of Shadow Visions, you can quite often find them, or multiple copies of them, and take the win if you have a single minion on the board by buffing it up with Power Word: Shield, Kabal Talonpriest, Divine Spirit, and Inner Fire. I took a beating from this combo in a mirror match where I was unable to immediately remove a Twilight Drake (that four attack). The downside is that you may end up with multiple dead cards in your hand, if you cannot get a board to stick. 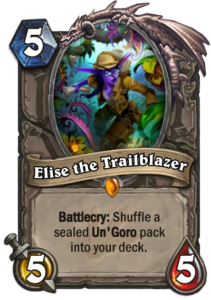 Third, you can consider adding even more value to the deck in the form of Elise the Trailblazer. Those Un’Goro packs that Elise opens tend to be pretty good, and with Shadow Visions you can have several! That said, I originally included Elise in this list but Dragon Priest is simply so filled with value that I’m not sure if it’s even needed. 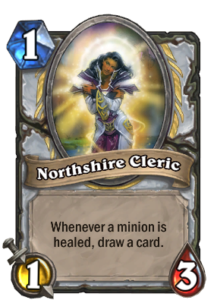 Typically, you go for Northshire Cleric, Radiant Elemental, and Power Word: Shield to start off with. Radiant Elemental + Power Word: Shield can give you a 2/5 minion for two mana! Depending on the matchup and the rest of your hand, you can also keep a Shadow Word: Pain, Netherspite Historian (usually with a dragon), or a Kabal Talonpriest to ensure that you can contest the board early on. In this particular list, there are numerous flex slots you can use to tech the deck for the meta. 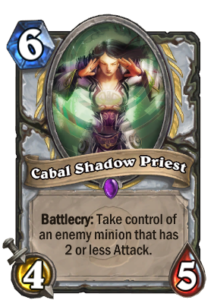 The most flexible ones are Kabal Songstealer and Cabal Shadow Priest. 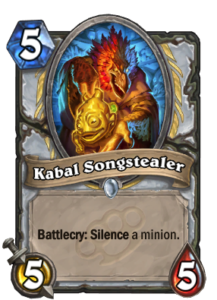 Kabal Songstealer gives you a silence effect, and it can be quite powerful in the current meta. Sherazin, Edwin VanCleef, Doomsayer, Quest Rogue’s Igneous Elemental (provided you can kill it to prevent bounce), minions buffed with Spikeridged Steed or Divine Spirit – there are lots of good targets. In the Freeze Mage matchup, you can even silence one of your own minions to free them from the freeze. Cabal Shadow Priest, on the other hand, is sweet against Taunt Warrior. Alley Armorsmith giving you trouble? Make it your own instead! Or steal some card draw from Freeze Mage. A powerful card, but comes down a little late, so running two does not seem worth it. 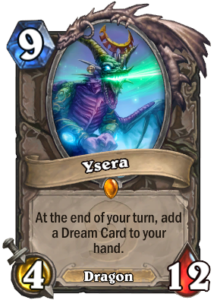 You can also consider replacing one of the Primordial Drakes with an end-game dragon, probably Deathwing or Ysera. With the Netherspite Historians though, the taunts are generally better as you can discover the end game. 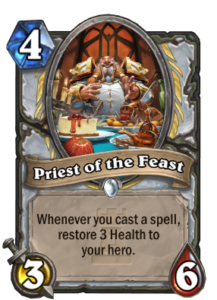 In a way, Priest of the Feast is also a flex slot. I originally ran Elise the Trailblazer instead of one of the Priests, but with the high number of Freeze Mages around right now, I feel that two copies of Priest of the Feast are needed. 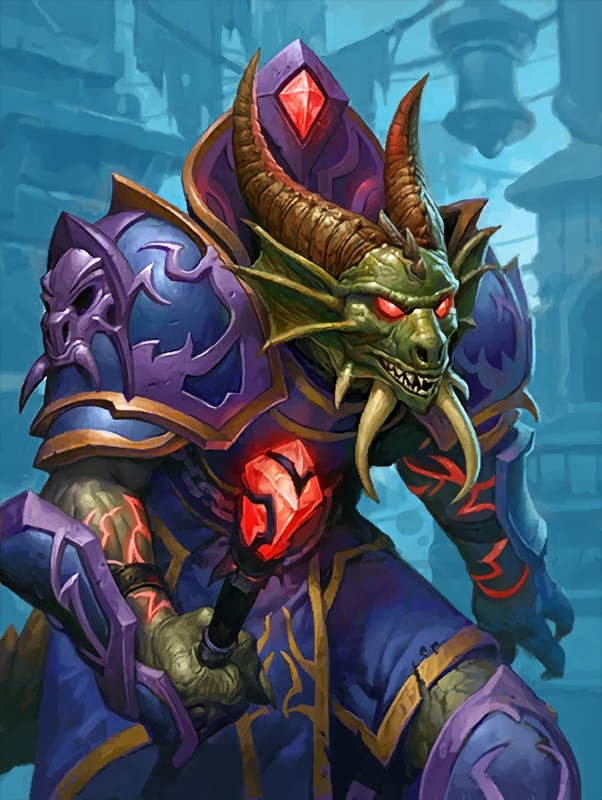 With so many dragons gone, Dragon Priest has changed. 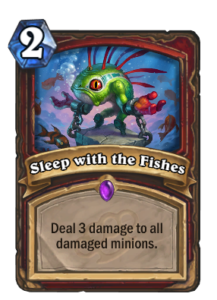 It is no longer an early-game taunt minion curve deck, and interestingly enough, its matchups have changed a lot as well. Right now, all varieties of Priest are among the strongest counters to Freeze Mage. With Drakonid Operatives, Dragon Priest has a chance to discover Ice Block to help defend, but the real difference is that Freeze Mage usually does not have that much burst damage anymore. OTK combos with Evolved Kobold are a thing of the past, and now Freeze Mage goes for Alexstrasza followed by around 15-18 damage from hand thanks to Primordial Glyph enabling it to pay some of the mana cost beforehand: for example, Fireball + Fireball + discounted Fireball for 18 damage. Freeze Mages can also run even double Pyroblasts to set up for that sufficient damage over multiple turns. Priest of the Feast is the key card in this matchup, and one of the main reasons it is included in the list. 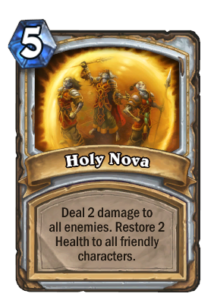 Relying on discovering that Ice Block or healing for two with the Hero Power is not quite enough to make the Freeze Mage matchup a good one, but adding in that extra healing from Priest of the Feast is usually enough to keep the Freeze Mage short of damage. Dragon Priest can, interestingly enough, challenge Quest Rogue even after the quest has been completed. 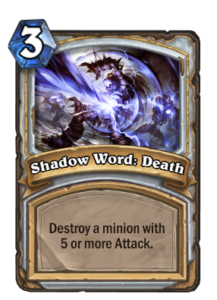 With a combination of Shadow Word: Deaths and Dragonfire Potions, cleaning up boards of 5/5s is something Priest excels at. However, you cannot always find your removal in time, or if the Quest Rogue finds enough charge minions and bounces, they can just smack you in the face repeatedly unless you manage to get a taunt in the way – and that only happens at 8 mana with the Primordial Drake. According to Vicious Syndicate’s stats, Quest Rogue is the favored deck here. Nonetheless, it is refreshing to play a deck that can survive even after the quest is completed, at least with the right draws. Miracle Rogue is another exciting, and fairly even, matchup. Against the most common Arcane Giants build, you have enough removal in the deck to answer every single threat in the Rogue deck: if you can find them in time and have enough mana to use them as those Arcane Giants can come in at the same time for a big swing. Using your removal carefully is the key to success. With all the early-game taunts gone, Dragon Priest can struggle against Pirate Warrior. If the Warrior has a bit of a low hand, the powerful area-of-effect damage and big taunts of Dragon Priest make it easy to stabilize, but often the Pirate Warrior is able to get to a position where Dragonfire Potion comes in too late and Primordial Drake has no chance to come down at all. In general, Dragon Priest is weaker against aggro than it used to be, but it still retains a very strong midgame and awesome value generation, making it able to stand toe-to-toe against Taunt Warrior and Midrange Paladin for some quite even and exciting games. Freeze Mage did not die with Ice Lance. Miracle Rogue did not die with Conceal. 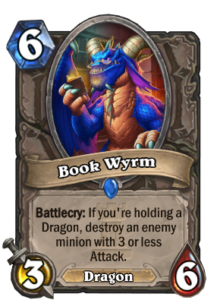 And, it turns out, even Dragon Priest did not die with Twilight Whelp, Wyrmrest Agent, Blackwing Technician, Brann Bronzebeard, Twilight Guardian, Blackwing Corruptor, and Azure Drake. Oh wow, it did lose a lot, didn’t it? 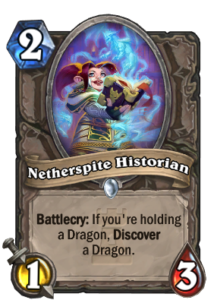 The new and renewed Dragon Priest is a powerful midrange deck that is a lot of fun to play. It no longer has that on-curve opener, but it can do a lot of tricks in the midgame to answer many threats and outvalue the opponent.